Blowout Sale! Save 51% on the rismart Newly Men's Dress Leather Oxfords Shoes European Trendy Lace up Brogues Black SN16899 US12 by rismart at SCRHI. Hurry! Limited time offer. Offer valid only while supplies last. British style pointed-toe oxfords, suitable for both formal and usual casual occasions. Stylish pattern design makes you more dashing and charming. British style pointed-toe oxfords, suitable for both formal and usual casual occasions. Stylish pattern design makes you more dashing and charming. It's made of synthetic leather but soft and comfortable. The size widely ranges from US7to US12.5, fit with both teenagers and men. 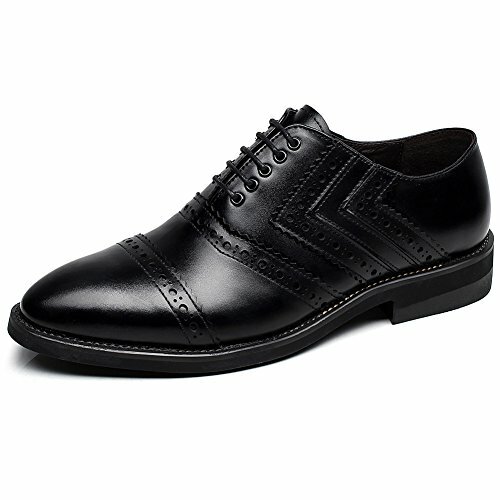 * Elegant--Classic oxfords combine with exquisite brogue embossing and pointed toe, stylish and dashing. * Comfort--Made of split leather for the upper and microfiber leather for the lining and insole,soft and comfy. * Wide Size Range--US7-US12.5,suitable for all the gentlemen. * Durable & Flexible--The outsole is of made of good quality rubber, can be bended down but won't crack. * Applicable--Suitable for all kinds of formal and semiformal occasions,like business meeting, office,evening party, reunion, friends gathering and so on, also good for daily wear. If you have any questions about this product by rismart, contact us by completing and submitting the form below. If you are looking for a specif part number, please include it with your message.